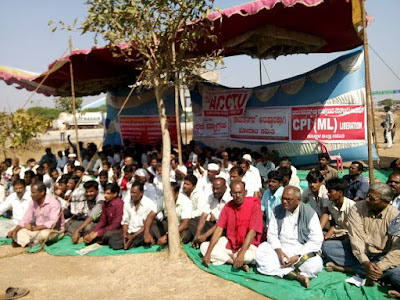 Mindteck Ltd along with two partners would be implementing an IT programme to integrate various local governments like city corporations and municipalities in Karnataka to execute the state government's ambitious eNagarpalika programme. 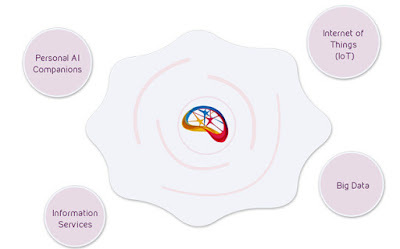 In tandem with the other two consortium partners, Mindteck will implement the complete portal and will work with the government to deploy technical resources. The project, which is in line with the union governments digital and smart city initiatives, will enable the delivery of government services integrated with various Zila Parishads under one platform. "The project will benefit citizens by enabling easy access to services, such as birth and death certificates, building approval permissions, property tax and other government-related documents and services," a company release said. "The programme is citizen-friendly and one of the best eNagarpalika implementations in the country," said Yusuf Lanewala, Mindteck Chairman and Managing Director. Mindtech has taken up other smart city programmes in collaboration with University of California (Berkeley), Nanyang Technological University (NTU), and the National University of Singapore (NUS), in Singapore, to build a world-class research model for building efficiency through an engagement with SinBerBEST, (Singapore-Berkeley Building Efficiency and Sustainability in the Tropics). An Intelligent Lighting Solution for a UK-based utility company that has announced record reductions in energy consumption and CO2 emissions. India’s largest online food ordering platform has come forward to support the Chennai flood victims by way of delivering over 7000 hygienic and healthy food packets every day, to the affected. The initiative is in partnership with restaurants from Hyderabad, Chennai (Bawarchi and Paradise biryani to begin with). To fulfil the distribution of these food packets carrying 3.5 tonnes of vegetarian biryani, foodpanda has partnered with NGO GiveAway. The packets will be carefully packed and delivered to Amir Mahal Palace, where volunteers from foodpanda and GiveAway will help distribute the food to over 15000 affected people every day, across the city. Aston Martin and Letv has signed a memorandum of understanding (MOU) on a research partnership for the development of connected electric vehicles. 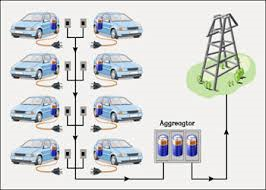 The partnership will see the two companies working together on research projects ranging from connected car technologies through to manufacturing consultation on new electric vehicles. It is envisaged that these technologies could feature in the future Rapid E, the first ever all-electric Aston Martin, which will be manufactured at the company’s UK headquarters in Gaydon, Warwickshire. The RapidE will draw on advanced technology solutions from leading global suppliers including those based in the UK and China. 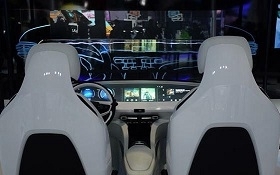 Following the announcement of their collaboration with Aston Martin in April this year, leading Chinese technology company Letv will bring their engineering and product development capabilities to help provide advanced connected car solutions to the RapidE. The new research partnership will also begin a feasibility study focused on bringing Aston Martin consulting expertise in high quality manufacturing to support the production of future Letv electric vehicles. 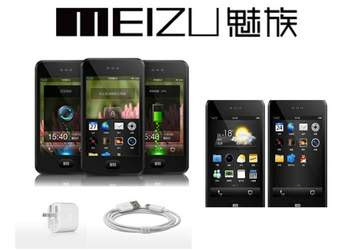 Meizu Technology (MEIZU), one of the fastest-growing Chinese smartphones company, announced the launch of its corporate office in India. MEIZU recently entered the Indian market with its flagship phone MX5 in August and since then has made rapid strides in the Indian market by offering two additional products the m2 note and m2. With the launch of its corporate office in Gurgaon, Meizu is well positioned to expand its customer service team in India and aims to hire around 100 employees by the next financial year. The office is already humming with an initial landing team from its headquarters in Zhuhai, China, and a team of recent hires from India. “With 46 functional customer service centers across 33 cities in India, the Meizu HQ in Gurgaon will play a pivotal role in expanding these services to 100 cities by 2016. We are also committed to providing future ready products and services to the Indian customers. As a result we are currently scouting for a location to set up a R&D center, to serve our Indian customers with better and localized products”said, David Dong, India Director. There were a total of 616 participants comprising of 101 teams that participated in the 'Tech for Good' Hackathon prelims that were conducted in 5 cities (Bangalore, Pune, Hyderabad, Delhi and Madurai) in the month of August organised by the Anita Borg Institute India. Out of total 101 teams 11 teams have made it to the finals which took place at the largest technical conference for women in India – the Grace Hopper Celebration of Women in Computing India (GHCI) 2015. The main objective of this hackathon is to code and work on ideas and projects that will have a social impact. Platform for Connecting Visually Impaired with Volunteers for the NGO Antardrishti. The finalists did a demo of their projects during the Hackathon finals and the top 3 winning teams were announced by a panel of judges. Antardrishti aims at creating an inclusive society with equal and full participation of the blind or visually impaired people. Their mission is to promote self –reliance among the visually impaired people by empowering them with education, skill building and mastering life skills. The app being developed is a platform to connect the visually impaired with volunteers across the country. Reap benefits research on ideas that are at an intersection of environment, education and civic problems to derive key insights from on-ground data. They develop low cost innovations to address environmental and civic problems. They build the next generation of problem solvers by involving students in implementing solutions for environmental and civic problems. The project being developed is a combination of both hardware and software that has an ability to provide real time information on when the garbage bins need to be emptied that optimizes and drastically cuts the cost of garbage collection. Neev is based out of Shivpuri, MP and they run a project for women – to make bags out of waste newspaper. They sell bags to various shops in Shivpuri & Delhi. Their project serves 2 purposes – to provide livelihood to women and replace plastic bags in Shivpuri. The app that was developed for Neev is a responsive page design app for logistics, inventory management and basic accounting with a dashboard view of visually appealing charts and graphs. 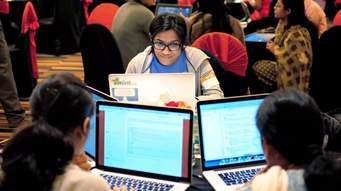 "The GHCI 2015 Hackathon with the theme of “Tech for Good” was a great channel to get women who are tech enthusiasts across multiple geographic locations, organizations and colleges to connect and work towards a common cause, which is to benefit the underprivileged, destitute, impaired and the needy in addition to solving environmental, civic and health problems", said Ms. Shaila Srinivas, Chairperson of the Hackathon. Wipro Ltd has announced signing an agreement to acquire German IT services company cellent AG for 73.5 million euros (Rs 518 crore). The German company is a leading IT consulting and software services outfit and has been offering IT solutions and services to its customers in the DACH region (Germany, Austria and Switzerland) for the past 14 years. 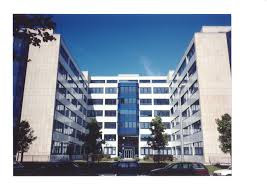 It (cellent AG) serves the DACH market region with a team of more than 800 consultants, who will now become part of Wipro. “The DACH market is a strategic growth and investment region for Wipro. This acquisition will provide Wipro with significant scale and prime customer relationships, especially in the manufacturing and automotive domains, which are key industry sectors in the DACH region”, said a Wipro spokesman. “We welcome cellent AG to the Wipro family. Cultural synergies and locational proximity are key to building successful customer relationships. Cellent is a well-established player with marquee customers, a well-known brand and has strong local talent. cellent will significantly boost our footprint in the DACH region, especially in the Manufacturing and Automotive domains”, said NS Bala, Chief Executive - Manufacturing and Hi-Tech, Wipro, said. YatraGenie Services Pvt Ltd, a leading hyper market-place for bus, cab, auto and hotel bookings, today announced that Renil Komitla, CEO, Yatra Genie Pvt. 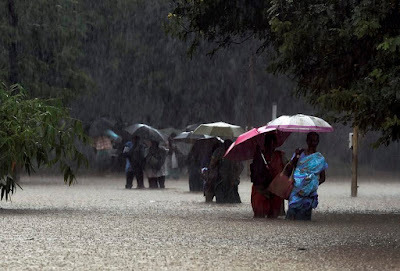 Ltd. will be donating an amount of Rs 30,00,000 (Thirty Lakhs) to the flood affected regions of Chennai in Tamil Nadu and Nellore in Andhra Pradesh. 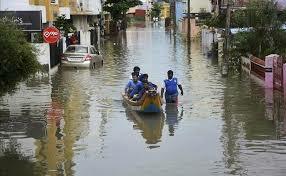 The floods are one of the worst to have hit the region in 100 years. Renil Komitla will be handing over the cheque to both the state governments. 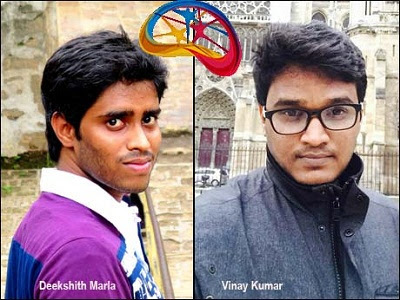 Arya.ai, an Artificial Intelligence start-up from Mumbai has been picked by ParisnCo, a French innovation agency, as one of 21 companies globally that do standout innovations. As a part of this initiative, Manipal Health will offer this solution across all its patients, and will be affordable, company officials said but did not get into specifics. Manipal Hospitals' corporate and teaching facilities will adopt 'Watson for Oncology', trained by MSK, that analyses data to identify evidence-based treatment options. This will help oncologists provide individualised healthcare, company officials said, adding this would be the first deployment of 'Watson' in India. 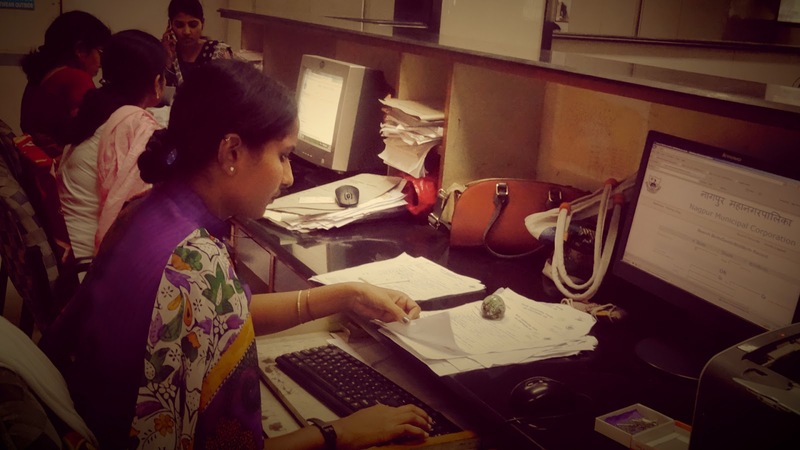 "This engagement represents a major step in the transformation of healthcare in India. 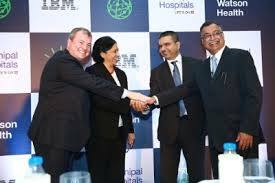 With IBM Watson, we are bringing cognitive computing to the healthcare ecosystem to help deliver greater value to patients in India," IBM India Managing Director Vanitha Narayanan said. Highlighting shortage of oncologists in India, she said there are over a million cases of cancer diagnosed every year. There are 1,600 patients to one oncologist in the country, compared to 1:100 ratio in the US, she said. IBM said to date, 'Watson for Oncology' has ingested nearly 15 million pages of medical content, including more than 200 medical textbooks and 300 medical journals. Using natural language, clinicians using 'Watson for Oncology' will be able to explore treatment options, analyse information provided, and gather evidence specific to a patients' individual health needs, it said. 'Watson' will benefit both oncologists and patients, Manipal Hospital Chairman Dr H Sudarshan Ballal said, adding that it be available for both rich and poor patients. Manipal said it would implement 'Watson' at its hospitals across the country where it has facilities for oncology and also affiliate with community oncologists. Manipal has 16 hospitals and 50 oncologists across the country and more than 2,00,000 people receive care for cancer at their facilities each year. 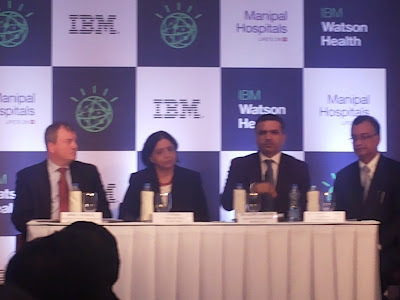 Stating that affordability is very important, Manipal Hospitals CEO and Managing Director Dr Ajay Bakshi said, "We have worked very closely with IBM to structure an economic model which works for Indian patients. That was our first starting point." “Without going into financial specifics, he adds, "It will be incredibly affordable." To a question, Bakshi said "It will take six months to implement 'Watson'. We are projecting that it will be done by May or June next year. For six months, we will be working with IBM to indigenise it and train it on Indian patients' database." 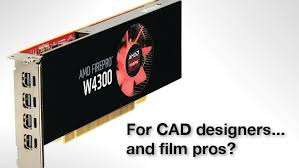 Today at Autodesk University 2015, AMD unveiled the AMD FirePro W4300 for the best Computer-Aided Design (CAD) performance that fits both small form factor (SFF) and tower workstations.The AMD FirePro W4300 card expertly integrates a powerful GPU and 4GB of GDDR5 memory within a low-profile design for installation in SFF as well as full-sized systems. Organizations can now confidently simplify their IT management by standardizing on a single, capable professional graphics solution throughout their workstation deployment. 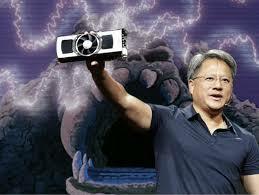 * 4GB GDDR5 GPU memory for large projects helping to improve workflow application responsiveness. * AMD Eyefinity multi-display technology2 that allows the use of up to six ultra-high resolution displays, helping users to multitask across multiple applications and displays with ease. * Four DisplayPort 1.2a connections standard (with support for up to six Display Port monitors via MST-enabled hub) and AMD FreeSync technology that enables GPU control of the display refresh rate for tear-free display updates, critical for media and entertainment applications and workflows. * OpenCL 2.0 support enabling developers to take advantage of new features that give GPUs more freedom to do the work they are designed to do. 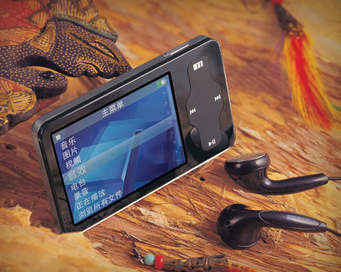 * Unique power monitoring and management technologies plus the maximum power consumption of 50W in a low-profile form factor. AMD PowerTune technology dynamically optimizes GPU power usage and AMD ZeroCore Power technology significantly reduces power consumption at idle. * Certification on more than 100 different applications for improved performance and reliability, including the most popular design and engineering and media and entertainment applications. AMD FirePro professional graphics drivers are released several times each year and include performance and feature improvements. 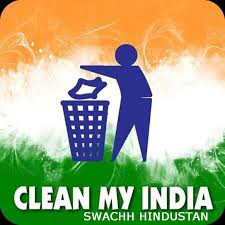 Tally Solutions, the premier Indian software product company, announced that the latest release - Tally.ERP 9 Release 5.1.3, will now be available with the new Swachh Bharat cess implemented in the product, to support Indian businesses in complying seamlessly with the new regulation. This will ensure that the implementation of the new cess is fast and smooth in all businesses that use Tally.ERP 9. 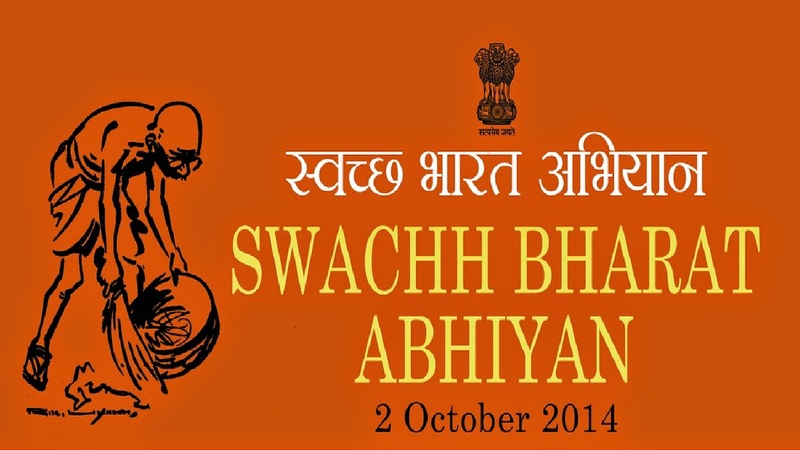 The current module will bring in the additional component to implement the Swachh Bharat Cess as announced by the Government of India recently. Tally Solutions will also introduce the return forms as and when the government notification for the same comes in. 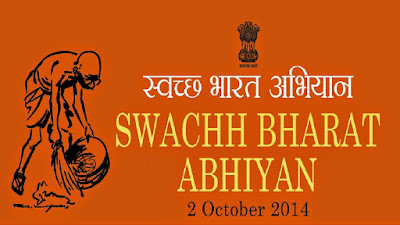 The Government of India notified the levy of Swachh Bharat cess at the rate of 0.5% on all taxable services effective from November 15, 2015, thus revising the new rate of service tax plus Swachh Bharat cess to 14.5%. With India becoming world’s fastest growing startup ecosystem country today, Startup India is the new buzzword by the Government of India. The numbers are telling—from 3,100 startups in 2014 to a projection of more than 11,500 by 2020… this is certainly not a passing trend. 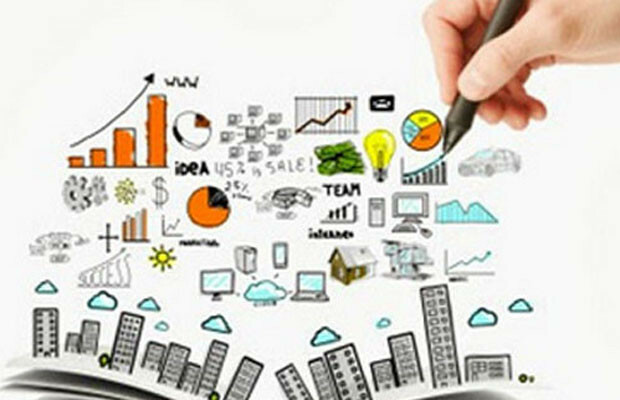 Venture capital investments in India reached Rs 15,600 crore (US$ 2363) till June 2015, surpassing the total Rs 14,850 crore (US$ 2250) invested in entire 2014, setting the stage for another record year as interest in local technology startups peak. In order to highlight the specific areas of growth opportunities and challenges being faced in and by the incubation ecosystem, Incubation India 2015, a Conference on Business Labs comprising the Investor, Incubator startups ecosystem was organized in Delhi today. Various Key decision makers, Start-ups, Incubators, VC’s& Young Entrepreneurs were the part of this first of its kind niche Conference in India to discuss the Initiatives taken to promote the concept of technology and business incubation in India, Marketing & communications strategies for early stage startups, Incubating in Healthcare sector: Opportunities and Challenges. Themed ‘Creating Value 360, the Incubation India 2015 conference provided an opportunity for interactive discussions and insights on incubation trends, solutions and unique initiatives. 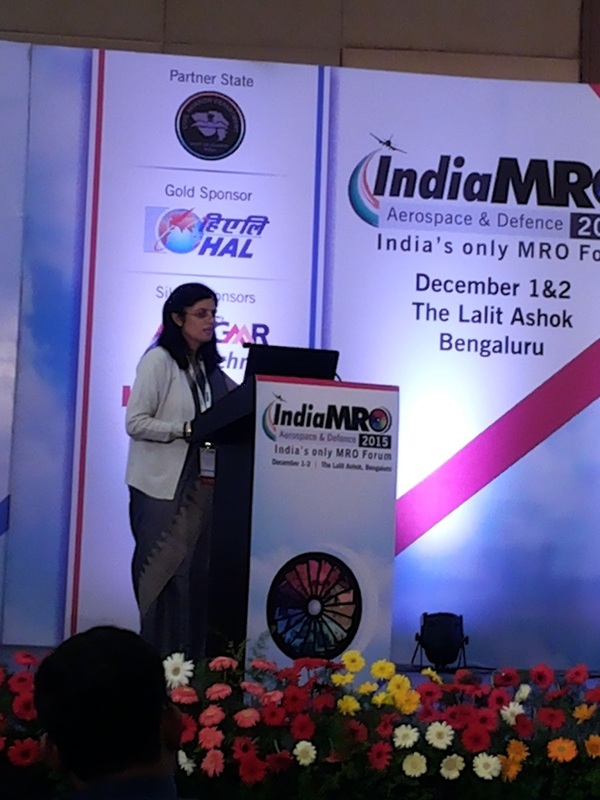 The Karnataka state government is trying to attract the global aerospace companies to set up a maintenance, repair and overhaul (MRO) facility in the Aerospace Park near the international airport on the city's outskirts and also at the old HAL airport located within the city. "We are ready to offer our excellent aviation facilities and domain expertise to maintain, repair and overhaul any type of passenger and cargo aircraft, including narrow and wide-bodied jets, fixed and rotary-winged choppers of domestic and international carries," adds. Kaveri Ranganathan. "In the 1,000-acre Aerospace Park at Devanahalli, we have a special economic zone (SEZ) for setting up aerospace related facilities, including an MRO to capitalise on the growing civil aviation traffic at the adjacent international airport," said Vandita Sharma, Karnataka’s Principal Secretary, Infrastructure Development. As the third busiest airport in the country after New Delhi and Mumbai, the Kempe Gowda international airport has about 450 passenger and cargo aircraft movements daily through the year. "With domestic and international passenger traffic projected to touch 18 million per annum by 2020 from 15 million annum in 2015, potential for aircraft service, including MRO is immense, as the airport is a strategic hub for South Asia," remarks Sharma. According to global audit firm KPMG, the MRO business in the Indian sub-continent is projected to grow to $2 billion by 2020 from $700 million in 2015, as the passenger aircraft fleet size is expected to be about 1,000 in 2020 from 700 currently, including 400 scheduled type. 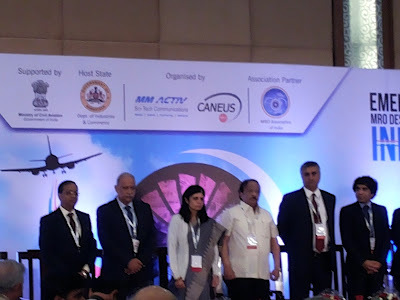 Presently in the absence of a hi-tech MRO facility in the country for private carriers, airlines have been sending their aircraft to Sri Lanka, Singapore or Dubai/Abu Dhabi, while national carrier Air India has its dedicated service facility in Mumbai, Nagpur and Hyderabad. The Bangalore International Airport Ltd (BIAL) consortium is soon building the second terminal and a second runway to expand the facilities in and around the airport to meet its growing needs for the next decade. The state and central governments are partners in the consortium with 13 percent each equity stake, while the G.V.K. Reddy-led private firms, including LnT, Zurich Airport and Siemens hold the majority (74 percent) stake. Private sector Yes Bank said said it has signed loan agreements worth $265 million with the US government's development finance arm, OPIC, and Wells Fargo to support small business development in India. "Yes Bank has signed an agreement with Overseas Private Investment Corporation (OPIC), the US government's development finance institution, for debt financing of $245 million to increase lending to micro, small and medium enterprises (MSMEs) in India," Yes Bank said in a stock exchange filing about the agreement signed in Washington DC. American Wells Fargo Bank will be sponsor and co-lender to the project, providing a loan of $20 million, to bring the total facility amount to $265 million, it added. "MSMEs are the growth engines and employment generators of our economy, and access to banking credit is one of the key enablers. 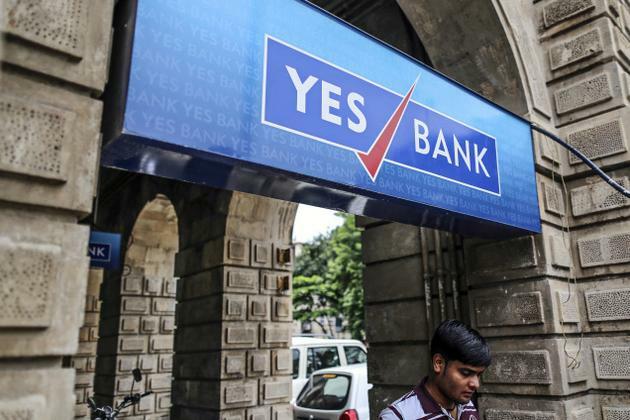 This significant co-financing agreement of Yes Bank with OPIC and Wells Fargo will help further accentuate Yes Bank's ability to address unique needs of SME and MSME sectors," said Yes Bank chief executive Rana Kapoor. "OPIC's exciting partnership with Yes Bank, a proven Indian lending institution, and Wells Fargo will spark inclusive economic growth in India," said OPIC president Elizabeth Littlefield. "Wells Fargo is pleased to sponsor this important facility on behalf of Yes Bank and work with OPIC as they continue to support Yes Bank's lending to the small and micro businesses vital to economic growth in India," said Wells Fargo's International head Richard Yorke. 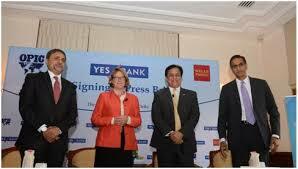 The commitments by OPIC and Wells Fargo were made during US President Barack Obama's visit to India in January. India's economy picked up pace in the second quarter of the current fiscal, comfortably outpacing China in the same quarter, but the stronger growth has dampened hopes of a rate cut when the Reserve Bank of India reviews its monetary policy on tomorrow. India's GDP rose 7.4 % in the second quarter of 2015-16, in line with expectations but faster than the 7% growth recorded in the preceding three-months. China's GDP rose 6.9% in the same quarter. 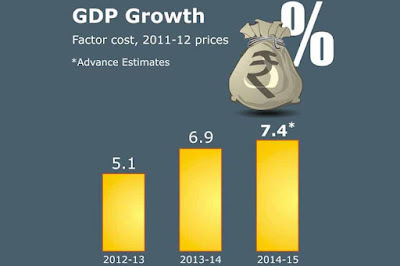 The high growth was driven by a robust 9.3% rise in gross value added (GVA) in the manufacturing sector. Despite a poor monsoon, agricultural sector did better than expected with a 2.2% rise in GVA versus 2.1% YoY. The GDP growth had declined to 7% in April-June quarter from 7.5% in the previous quarter raising concerns that the recovery was not shaping well. RBI is expected to maintain interest rates after consumer inflation rose to 5% in October and the strong manufacturing growth numbers. The stronger growth will provide a boost to the Narendra Modi government in the ongoing parliament session wherein it is looking to pass key legislation including constitutional amendment bill to launch the goods and services tax ( GST). 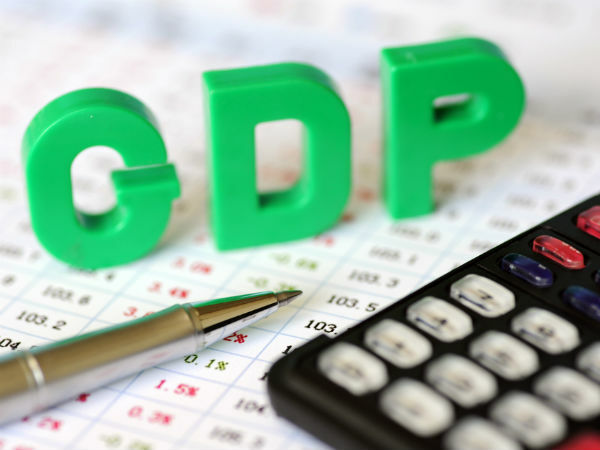 GDP at constant (2011-12) prices in Q2 of 2015-16 is estimated at Rs 27.57 lakh crore, as against Rs 25.66 lakh crore in Q2 of 2014-15 showing a growth rate of 7.4%, according to data released by the Central Statistics Office, Ministry of Statistics and Programme Implementation. Quarterly GVA for quarter was estimated at Rs 25.80 lakh crore, as against Rs 24.02 lakh crore in Q2 of 2014-15, showing a growth rate of 7.4 % over the corresponding quarter of previous year. As per the official data, the economic activities which registered growth of over 7.0 % in the second quarter were trade, hotels and transport and communication and services related to broadcasting, financial, insurance, real estate and professional services and manufacturing. The growth in the 'agriculture, forestry and fishing', 'mining and quarrying', 'electricity, gas, water supply & other utility services, 'construction' and 'public administration, defence and other services' was 2.2 %, 3.2 %, 6.7 %, 2.6 % and 4.7 %, respectively, during this period. Microsoft has announced the launch of Lumia 950 and Lumia 950 XL, the first Lumia phones to come pre-loaded with Windows 10, in India. Designed to offer consumers the best of Windows 10 combined with powerful and performance driven technology, the new flagship devices include innovative features like Cortana, Windows Hello beta for Lumia and Continuum for phones. With stunning HD displays, new PureView cameras with 20 megapixel sensors and triple LED natural flash that shoots 4K video, as well as the latest in processing power, the Lumia 950 and Lumia 950 XL represent the best innovation from Microsoft. Starting today, the Lumia 950 and Lumia 950 XL will be available for pre-booking at Microsoft Priority Resellers across the country, Microsoft Store on Amazon.in and retail chains of Croma, Reliance and Sangeetha at a best buy price of Rs 43,699 and Rs 49,399 respectively. Consumers will get Microsoft Display Dock free as a limited period offer. Airtel consumers can double their data for free on purchasing their Lumia 950 and Lumia 950XL. 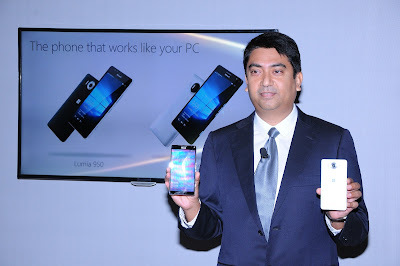 * Lumia 950 and Lumia 950 XL are the first Lumia phones to come pre-loaded with Windows 10 – delivering on our promise of one familiar and consistent experience that transitions seamlessly across Windows devices from key apps like built-in Office to access all your files, both personal as well as professional, via OneDrive and the cloud. * Both Lumia 950 and Lumia 950 XL feature Continuum for phones, enhanced by the optional Microsoft Display Dock accessory. This Windows 10 feature allows people to use their phone like a PC by connecting it to a monitor and transforming it for larger-screen entertainment, or adding a keyboard and mouse to work like a PC with Windows 10 apps like Microsoft Office, while simultaneously taking calls or performing other tasks. 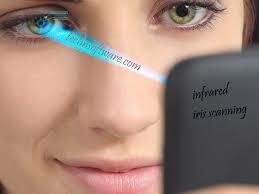 * As the latest premium handsets, these phones boast superior performance. Both devices feature a QuadHD AMOLED display featuring 518 ppi for Lumia 950 XL and 564ppi for Lumia 950, which means photos, videos and even simple reading show up well, even in sunlight. * Microsoft’s PureView technology is built into both Lumia 950 and Lumia 950 XL cameras, boasting a 20MP sensor and triple LED natural flash. The camera captures the perfect image, even in the most challenging conditions, and those photos can be automatically synced across all Windows 10 devices with the Windows Photo app and shared easily with friends and family. Both Lumia 950 and Lumia 950 XL come with 5MP wide angle front camera. * Integrated with Cortana, these phones are perfect for those who want to stay organized and efficient. Cortana works across your entire Windows 10 device family, but is with you all the time with these phones. Set her up to give news updates, calendar reminders, messages, appointments or even flight information. * To make this all possible, both phones also have the latest-generation Qualcomm Snapdragon processors to get these things done faster.